Browse for circuit breakers by vehicle make and model. On most electric scooters the toggle switch circuit breaker is located in the under-seat compartment and held into place with the electrical wires that attach to it so a mounting rail is not used, however, for custom applications where securely mounting one or more toggle switch circuit breakers is necessary then this mounting rail with two adjustable stoppers is available. Made from yellow zinc plated steel. 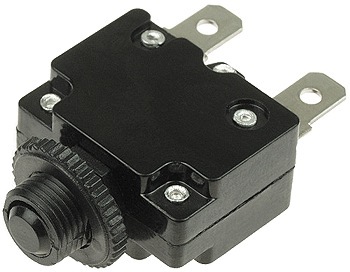 The rail is 3-7/8" long and holds between one and four 11/16" wide toggle switch circuit breakers. The rail can be cut shorter if needed. The two stoppers are pressed against the sides of the circuit breaker(s) and then their screws are tightened to secure them to the rail. 20A 12-100 Volt DC toggle switch circuit breaker. Commonly used on larger street legal electric scooters, bikes, and mopeds. Cable clamp terminals on top and bottom sides of circuit breaker tighten with a Phillips screwdriver and accept stranded wire up to 5/16" OD (6 AWG/Gauge). DZ47-63 B20 circuit breaker. Replaces and upgrades DZ47-63 C20 circuit breakers. 25A 12-100 Volt DC toggle switch circuit breaker. Commonly used on larger street legal electric scooters, bikes, and mopeds. 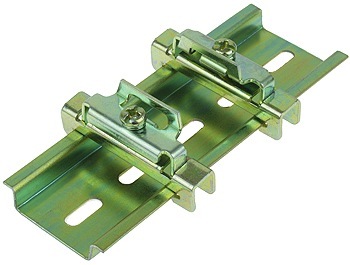 Cable clamp terminals on top and bottom sides of circuit breaker tighten with a Phillips screwdriver and accept stranded wire up to 5/16" OD (6 AWG/Gauge). DZ47-63 B25 circuit breaker. Replaces and upgrades DZ47-63 C25 circuit breakers. 32A 12-100 Volt DC toggle switch circuit breaker. Commonly used on larger street legal electric scooters, bikes, and mopeds. 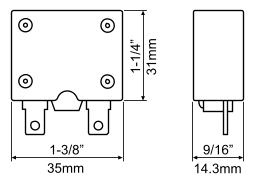 Cable clamp terminals on top and bottom sides of circuit breaker tighten with a Phillips screwdriver and accept stranded wire up to 5/16" OD (6 AWG/Gauge). DZ47-63 B32 circuit breaker. Replaces and upgrades DZ47-63 C32 circuit breakers. 40A 12-100 Volt DC toggle switch circuit breaker. Commonly used on larger street legal electric scooters, bikes, and mopeds. 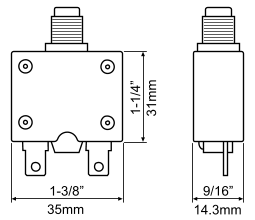 Cable clamp terminals on top and bottom sides of circuit breaker tighten with a Phillips screwdriver and accept stranded wire up to 5/16" OD (6 AWG/Gauge). 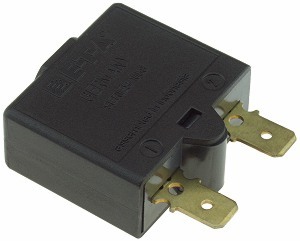 DZ47-63 B40 circuit breaker. Replaces and upgrades DZ47-63 C40 circuit breakers. 50A 12-100 Volt DC toggle switch circuit breaker. Commonly used on larger street legal electric scooters, bikes, and mopeds. 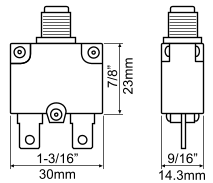 Cable clamp terminals on top and bottom sides of circuit breaker tighten with a Phillips screwdriver and accept stranded wire up to 5/16" OD (6 AWG/Gauge). DZ47-63 B50 circuit breaker. Replaces and upgrades DZ47-63 C50 circuit breakers. 63A 12-100 Volt DC toggle switch circuit breaker. Commonly used on larger street legal electric scooters, bikes, and mopeds. Cable clamp terminals on top and bottom sides of circuit breaker tighten with a Phillips screwdriver and accept stranded wire up to 5/16" OD (6 AWG/Gauge). DZ47-63 B63 circuit breaker. Replaces and upgrades DZ47-63 C63 circuit breakers. 80A 12-100 Volt DC toggle switch circuit breaker. Commonly used on larger street legal electric scooters, bikes, and mopeds. Cable clamp terminals on top and bottom sides of circuit breaker tighten with a Phillips screwdriver and accept stranded wire up to 3/8" OD (2 AWG/Gauge). DZ47-125 C80 circuit breaker. 100A 12-100 Volt DC toggle switch circuit breaker. Commonly used on larger street legal electric scooters, bikes, and mopeds. Cable clamp terminals on top and bottom sides of circuit breaker tighten with a Phillips screwdriver and accept stranded wire up to 3/8" OD (2 AWG/Gauge). DZ47-125 C100 circuit breaker. 125A 12-100 Volt DC toggle switch circuit breaker. Commonly used on larger street legal electric scooters, bikes, and mopeds. Cable clamp terminals on top and bottom sides of circuit breaker tighten with a Phillips screwdriver and accept stranded wire up to 3/8" OD (2 AWG/Gauge). DZ47-125 C125 circuit breaker. 125A 12-100 Volt DC 2 pole toggle switch circuit breaker. The levers of both poles are connected together so if one pole trips the other pole will turn off along with it. Commonly used on larger street legal electric scooters, bikes, and mopeds. Cable clamp terminals on top and bottom sides of circuit breaker tighten with a Phillips screwdriver and accept stranded wire up to 3/8" OD (2 AWG/Gauge). 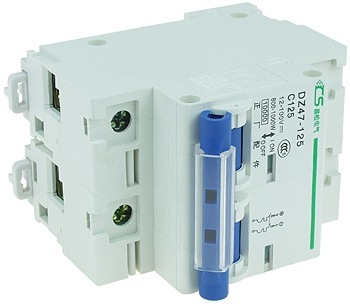 DZ47-125 C125 2P circuit breaker. 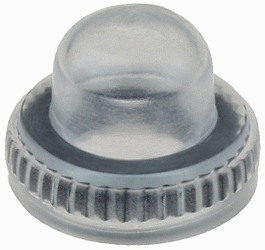 Protective mini push button circuit breaker cover with round top for circuit breakers sold below. Keeps dust, water, and moisture out to prevent failure and prolong the life of the circuit breaker. 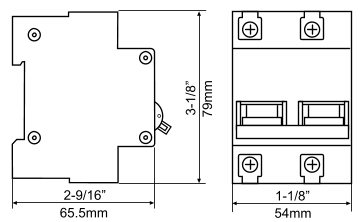 5A circuit breaker/reset button with plastic body. Compatible with 12V-72V DC electric scooters and bicycles. Button pops out when tripped. Two 1/4" tab terminals on back of circuit breaker. Fits 7/16" diameter opening. Includes mounting hardware. 7A circuit breaker/reset button with plastic body. Compatible with 12V-72V DC electric scooters and bicycles. Button pops out when tripped. Two 1/4" tab terminals on back of circuit breaker. Fits 7/16" diameter opening. Includes mounting hardware. 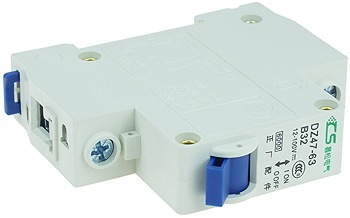 10A circuit breaker/reset button with plastic body. Compatible with 12V-72V DC electric scooters and bicycles. Button pops out when tripped. Two 1/4" tab terminals on back of circuit breaker. Fits 7/16" diameter opening. Includes mounting hardware. 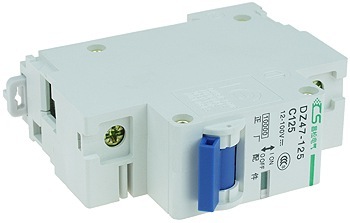 15A circuit breaker/reset button with plastic body. Compatible with 12V-72V DC electric scooters and bicycles. Button pops out when tripped. Two 1/4" tab terminals on back of circuit breaker. Fits 7/16" diameter opening. Includes mounting hardware. 20A circuit breaker/reset button with plastic body. Compatible with 12V-72V DC electric scooters and bicycles. Button pops out when tripped. Two 1/4" tab terminals on back of circuit breaker. Fits 7/16" diameter opening. Includes mounting hardware. 25A circuit breaker/reset button with plastic body. Compatible with 12V-72V DC electric scooters and bicycles. Button pops out when tripped. Two 1/4" tab terminals on back of circuit breaker. Fits 7/16" diameter opening. Includes mounting hardware. 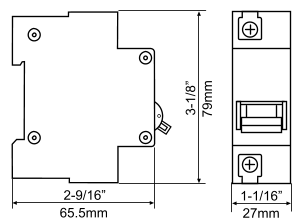 Protective push button circuit breaker cover with flat top for circuit breakers sold below. Keeps dust, water, and moisture out to prevent failure and prolong the life of the circuit breaker. 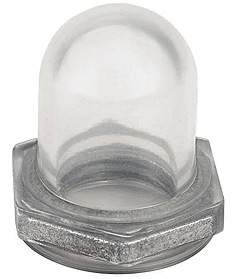 Protective push button circuit breaker cover with round top for circuit breakers sold below. Keeps dust, water, and moisture out to prevent failure and prolong the life of the circuit breaker. 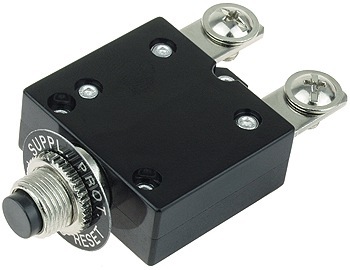 10A circuit breaker/reset button. Compatible with 12V-72V DC electric scooters and bicycles. Button pops out when tripped. Push to reset. Two 1/4" tab terminals on back side of circuit breaker. Fits 7/16" diameter opening. Includes mounting hardware. 15A circuit breaker/reset button. Compatible with 12V-72V DC electric scooters and bicycles. Button pops out when tripped. Push to reset. Two 1/4" tab terminals on back side of circuit breaker. Fits 7/16" diameter opening. Includes mounting hardware. 20A circuit breaker/reset button. Compatible with 12V-72V DC electric scooters and bicycles. Button pops out when tripped. Push to reset. Two 1/4" tab terminals on back side of circuit breaker. Fits 7/16" diameter opening. Includes mounting hardware. 25A circuit breaker/reset button. Compatible with 12V-72V DC electric scooters and bicycles. Button pops out when tripped. Push to reset. Two 1/4" tab terminals on back side of circuit breaker. Fits 7/16" diameter opening. Includes mounting hardware. 30A circuit breaker/reset button. Compatible with 12V-72V DC electric scooters and bicycles. Button pops out when tripped. Push to reset. Two 1/4" tab terminals on back side of circuit breaker. Fits 7/16" diameter opening. Includes mounting hardware. 35A circuit breaker/reset button. Compatible with 12V-72V DC electric scooters and bicycles. Button pops out when tripped. Push to reset. Two 1/4" tab terminals on back side of circuit breaker. Fits 7/16" diameter opening. Includes mounting hardware. 40A circuit breaker/reset button. Compatible with 12V-72V DC electric scooters and bicycles. Button pops out when tripped. Push to reset. Two 1/4" tab terminals on back side of circuit breaker. Fits 7/16" diameter opening. Includes mounting hardware. 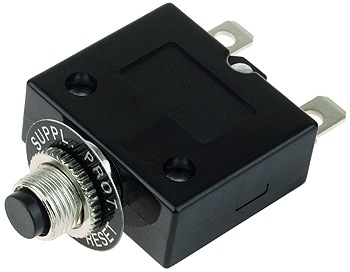 45A circuit breaker/reset button. Compatible with 12V-72V DC electric scooters and bicycles. Button pops out when tripped. Push to reset. Two 1/4" tab terminals on back side of circuit breaker. Fits 7/16" diameter opening. Includes mounting hardware. 50A circuit breaker/reset button. Compatible with 12V-72V DC electric scooters and bicycles. Button pops out when tripped. Push to reset. Two 1/4" tab terminals on back side of circuit breaker. Fits 7/16" diameter opening. Includes mounting hardware. 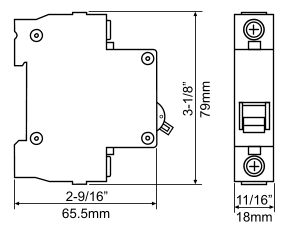 Protective push button circuit breaker cover for circuit breakers sold below. Keeps dust and water out to prevent failure and prolong the life of the circuit breaker. 40A circuit breaker/reset button. Compatible with 12V-72V DC electric scooters and bicycles. Button pops out when tripped. Push to reset. Two screw terminal connectors on back side of circuit breaker for #10 ring terminals. Fits 7/16" diameter opening. Includes mounting hardware. 50A circuit breaker/reset button. Compatible with 12V-72V DC electric scooters and bicycles. Button pops out when tripped. Push to reset. Two screw terminal connectors on back side of circuit breaker for #10 ring terminals. Fits 7/16" diameter opening. Includes mounting hardware. 60A circuit breaker/reset button. Compatible with 12V-72V DC electric scooters and bicycles. Button pops out when tripped. Push to reset. Two screw terminal connectors on back side of circuit breaker for #10 ring terminals. Fits 7/16" diameter opening. Includes mounting hardware. 70A circuit breaker/reset button. Compatible with 12V-72V DC electric scooters and bicycles. Button pops out when tripped. Push to reset. Two screw terminal connectors on back side of circuit breaker for #10 ring terminals. 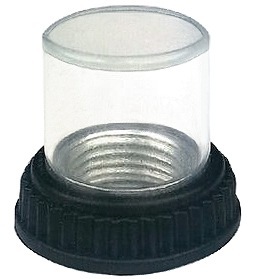 Fits 7/16" diameter opening. Includes mounting hardware. 30A automatically resetting circuit breaker with plastic body. Compatible with 12V-72V DC electric scooters and bicycles. Auto resets itself in around one minute. Two 1/4" quick connect tab terminals.